$25 per rod (angler); maximum of two rods per day. One mile of Fourmile Creek at 9,700 feet elevation. Optimal stream flows range from 10 to 25 cfs but fishing can be good at higher flows if the water is clear. 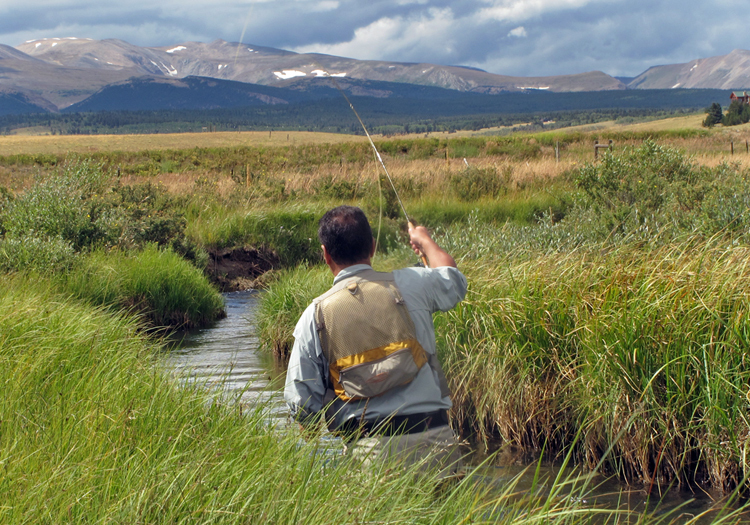 Fourmile Creek is perfect small water fishing with a three-weight fly rod. Stream enhancements in 2010 greatly increased fish habitat and reduced bank erosion. Countless tight meanders, deep pockets and undercut banks harbor abundant browns in the 5 to 12 inch range, with a few browns up to 18 inches. This property has also been stocked with rainbows in the 12-18 inch range. A progression of aquatic hatches make for good dry fly-fishing after runoff, along with terrestrial insects that appear in July. Tight meander loops allow two anglers to leap frog while keeping track of what has already been fished. Due to its small size and large population of wild browns, anglers should stay low and carefully work every niche deeper than six inches. While the majority of fish are wild browns under 12 inches, their sheer numbers present stealthy anglers with the opportunity for non-stop action on dry flies and small (#16-20) beadhead nymphs. A conservation easement funded by Great Outdoors Colorado now protects wetlands and riparian habitat on the ranch. There are no sanitary facilities on this property. The nearest restrooms, drinking water and other services are located in the town of Fairplay. Please plan accordingly on the day of your arrival. Lightning is a very real hazard and there is NO shelter anywhere on this meadow property. Pay close attention to the weather because it's a 15-20 minute walk from the stream back to your car! This is a working ranch with livestock...DO NOT approach or attempt to feed the cattle or yaks! Please cross fences only where fence ladders are provided (in two places). Fast water can be hazardous in streams of any size. If the water is muddy, be sure you are not stepping off the bank into a deep pool while wading. 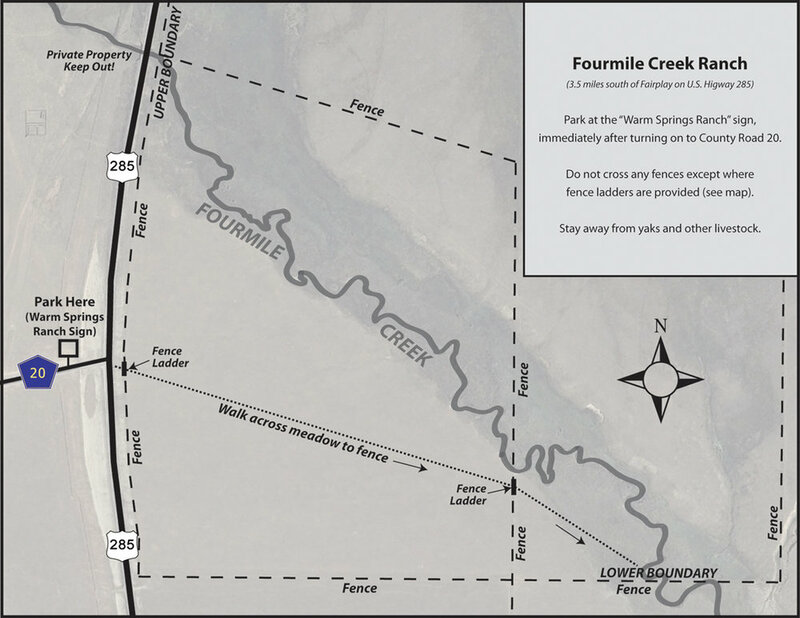 The designated parking area for Fourmile Creek Ranch is on public land along Highway 285. While vandalism and theft are rare, we suggest hiding any valuables and locking your vehicle while fishing. Lower Fourmile Creek Ranch is located 3.5 miles south of Fairplay, at the intersection of U.S. Highway 285 and County Road 20. The property is accessed via a fence ladder across Highway 285 from the parking area (“Warm Springs Ranch” sign).